This miniature blanket or hope chest is from the extraordinary Harding Collection. The dollhouse miniature chest is done in 1:12 scale, all wood construction and finished in a fabulous Mahogany color with hand painted gold accent detailing. The chest opens and closes and will delight even the pickiest miniature collector. Find more dollhouse furniture from the Harding Collection by searching for "Harding". 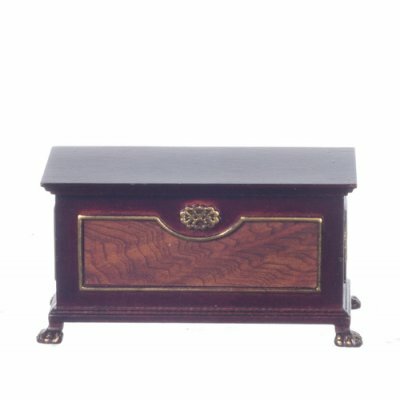 This Harding Blanket Chest Mahogany w/ Hand Painted Detail is supplied by Aztec Miniatures, which generally ships within 8 business day(s) of you placing your order .